A beautiful display of scintillating pink and fuchsia blooms. 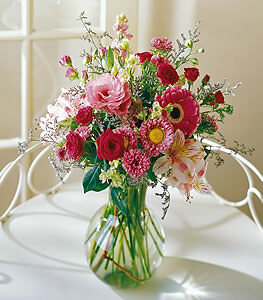 Hot pink spray roses and a mini gerbera daisy, pink lisianthus, larkspur and asters, and rosario alstroemeria are designed in a classic glass vase. A lovely and feminine gift.